Born in Yorkshire, Kate spent her childhood growing up in Sheffield and Manchester, often visiting her grandmother in Steyning. Her father was a Suffragan Bishop who set up the revolutionary Sheffield Industrial Mission for the Church of England. 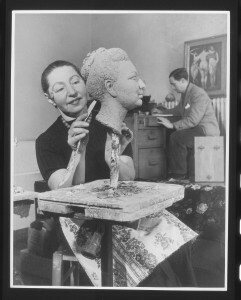 Her mother was artistic to an amateur level but also a great collector, as a patron she knew many artists. Kate remembers a childhood home filled with paintings, ceramics and sculptures. Her parents understanding of the visual arts allowed her the freedom to move schools after her O-levels to the High School of Art in central Manchester. Here she studied her A-levels becoming fascinated with ceramics. She feels fortunate to have studied under some fabulous teachers throughout her education, during her foundation course at Rochdale, at the Camberwell School of Art where she obtained her first class degree and at the Royal College where she obtained her masters degree. 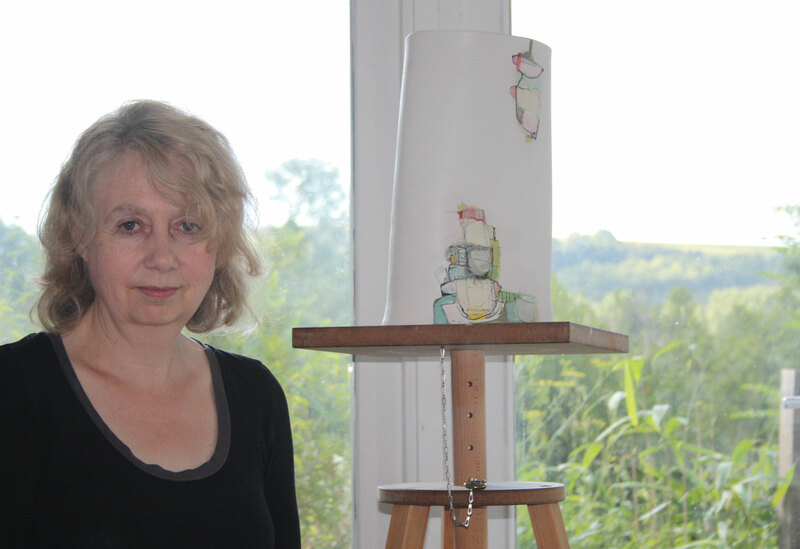 After higher education Kate settled in London, establishing herself in the art world and in 1987 obtained a position as tutor coordinator for the ceramic department at City Lit, a centre for adult education in London. 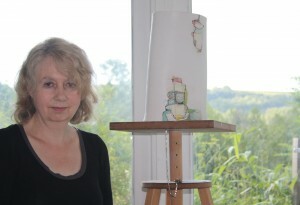 Here she set up a Ceramic Diploma Course, allowing a new generation of ceramicists to enjoy informed tutelage by leading experts in the field of ceramics. It was not until the premature birth of her child after just 26 weeks of pregnancy that she considered dividing her time between London and Sussex. Her son was born with cerebral palsy and in the absence of a suitable school in London, Kate found a specialist school near Five Oaks. Ingfield Manor School has an approach towards conductive education and is overseen by the charity SCOPE. After living in a few locations in Sussex she settled in Storrington, moving to Sussex felt like coming home after her visits as a child. Her home is nestled at the foot of the South Downs with spectacular uninterrupted views of the rolling hills. Kate is still at City Lit where she now works as joint head of all visual arts and is proud of the recent Grade 1 Ofsted inspection, establishing the largest college for adult education as a centre for excellence in visual arts. Perhaps it was her own expert teachers throughout her schooling that has inspired her passion to establish herself as an excellent tutor. When other similar courses have closed in London, Kate is determined to preserve the course for the future to enable young people to benefit from it. Kate has always found time to create. 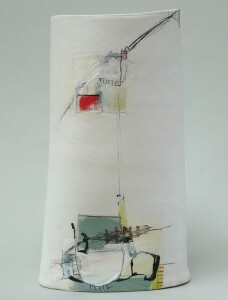 In addition to her studio in Storrington, she recently set up another studio in Vanguard Court, Camberwell, London. As a ceramicist Kate creates hand-built open vessels, the form is built from slabs of rolled white stoneware clay largely in an intuitive way. Kate always carries a sketchbook and after the open vessel has dried, she returns to these sketchbooks to seek inspiration for the decoration. This is carried out with various ceramic pigments, including oxides, underglaze colours and body stains. The vessels are hand painted using a gestural drawing technique, a very free approach that usually applies to capturing movement but which Kate has adapted to capturing the ‘feeling’ of a landscape, seascape or other subject in an abstracted way. 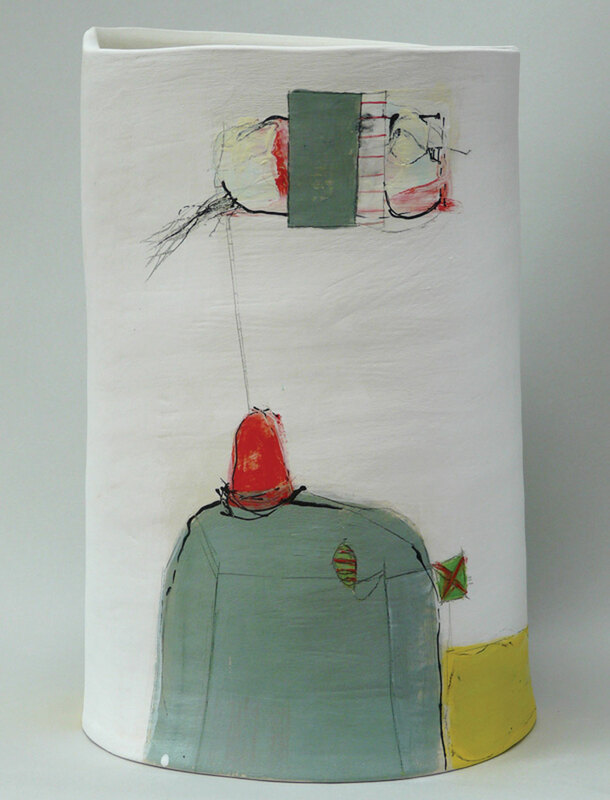 Kate also paints on board and canvas and this often informs and echoes the work on her ‘three-dimensional’ canvas – the ceramic vessels. Does Sussex inspire her work? Very much so, she loves the freedom that walking on the South Downs provides and it is the almost aerial view of the landscape and patterns of the fields that translates onto the open vessels. Other areas of Great Britain also inspire her. She generally enjoys areas of wilderness such as the far west of Cornwall and the north-west of Scotland, particularly the Inner and Outer Hebrides. The feeling of ‘getting away from it all’ allows her to continue to be creative. Once or twice a year Kate exhibits with Shirley Crowther Contemporary Art in Ditchling, but her work can be seen next at the ‘Ceramic Now’ exhibition with the Milton Gallery at St Pauls School, Barnes, from 17th November to 2nd December, followed by an open studio event in Camberwell in the beginning of December. 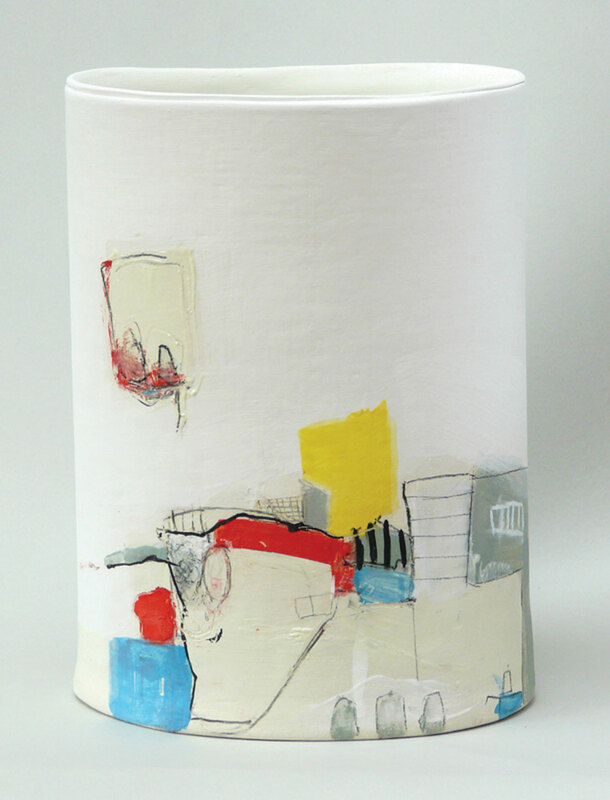 Kate has an instantly recognisable style, created by transferring the unique interpretation of her surroundings onto ceramics. She incorporates colours, textures, mark-making and uncomplicated abstraction with unrivalled success. 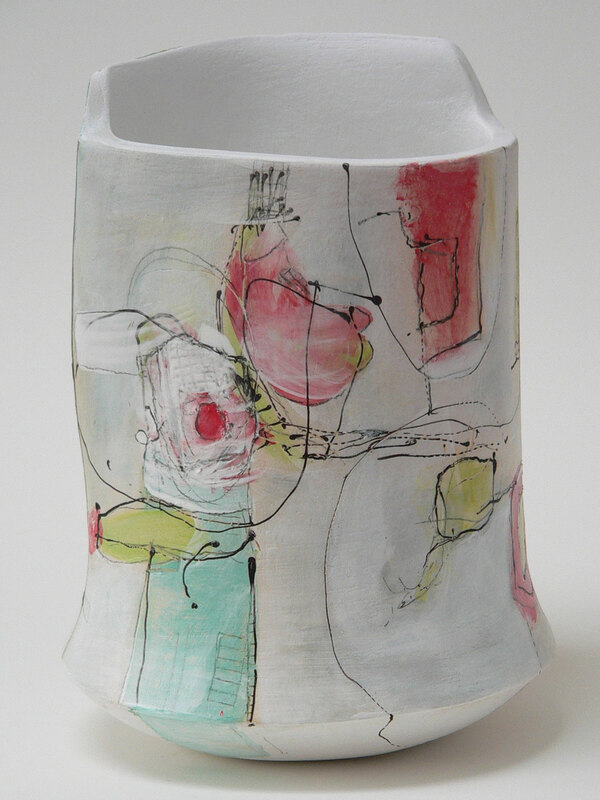 Combining the sculptural qualities of the forms with her refined painterly decoration allows her open vessels to hold a strong, but not dominating, presence within an interior. Nicholas’ article was originally published in Sussex Life magazine in October 2011. The Mystery Towers or Naval Giants at Southwick. There is little doubt that Britain’s coastline has played a huge part in its success as a great nation. It has acted as a vital gateway for exploration, trade and harvest as well as an outline that marks it apart from the rest of Europe. Unsurprisingly it has also played an important part in times of war. In reaction to the growing losses of the allied fleet through the onslaught of German U-boat attacks and fears of a German invasion, British Admiralty sought to construct a series of towers that would stretch all the way from Dungeness, Kent, to Cap Gris Nez off the Western Coast of France. 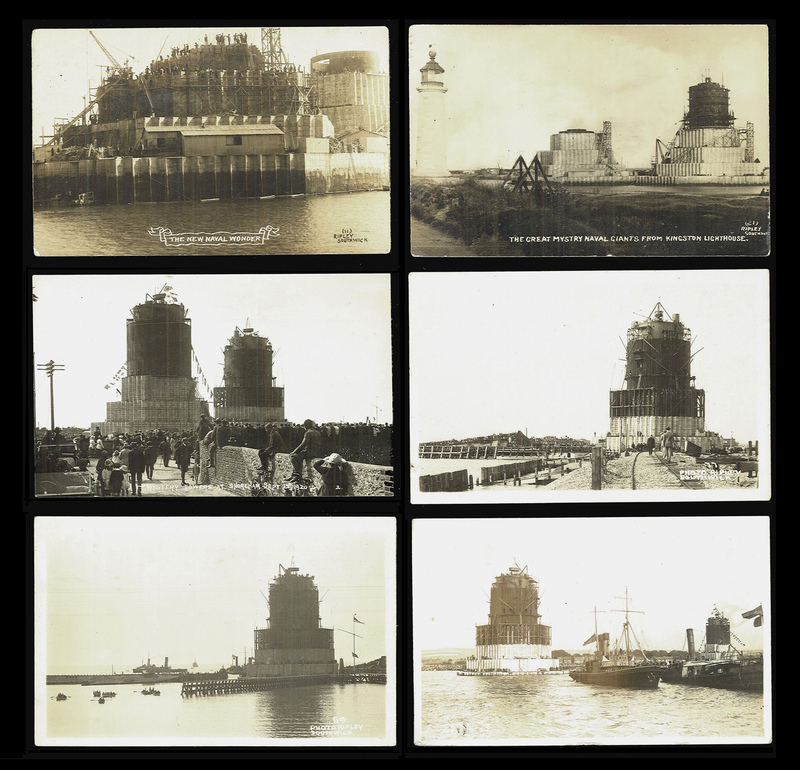 These floating forts were designed by civilian architect Mr G. Menzies and measured over 90ft high, they were intended to be united by steel boom nets and protected by mines. The towers were capable of providing a gun mounted defence system that could be manned by anything up to 100 servicemen. Work on the so-called naval giants started in June 1918, including two at Southwick, near Shoreham, Sussex. The understandable secrecy of such a project in wartime gave the structures the local nicknames of the ‘Mystery Towers’. With Armistice in November 1918, the plan never came to total fruition. Several of the towers did get built, including the two at Southwick. The First of these was towed out by steam tug on 12th September 1920 to become the Nab Tower off the coast of the Isle of Wight, the other was eventually dismantled. Locals at the time thought this was rather lucky, as it is rumoured the second was built 6ft too wide to leave the harbour mouth. Whilst today no visible remains of these important local monuments survives, their memory lives-on through the vintage picture postcard which document this interesting folly of the First World War. On Tuesday 1st November 2011 Lot 3046 will be going under the gavel at Toovey’s Spring Gardens auction rooms in the Sale of Paper Collectables. This lot consists of two albums containing 247 important postcards relating to Southwick and its environs, the albums include 25 postcards featuring the rise of the Mystery Towers (selection pictured above, click for larger image, for more images of the lot click here), most by local photographer Joseph Gurney Ripley. Offered in the specialist sale with a presale estimate of £1200-1800, these postcards brilliantly bring to life this moment in Sussex history. Posted on October 22, 2011 November 2, 2011 Author NicholasCategories Auction HighlightsTags Auction Highlights, Paper Collectables, Postcard Auctions, Specialist Sales, Sussex History1 Comment on The Mystery Towers or Naval Giants at Southwick. ADVANCE NOTICE: To be offered in our forthcoming auction of Paper Collectables on 1st November 2011. Charles II, King of England, and Samuel Pepys. 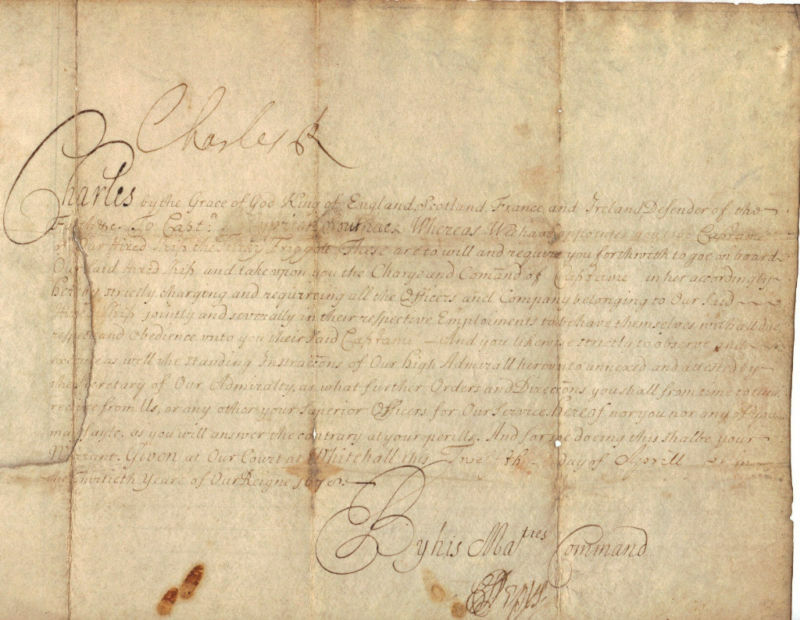 A manuscript document on vellum in a secretarial hand, signed by King Charles II and countersigned by Samuel Pepys. Whitehall, London: dated 12th April 1678. 1p. 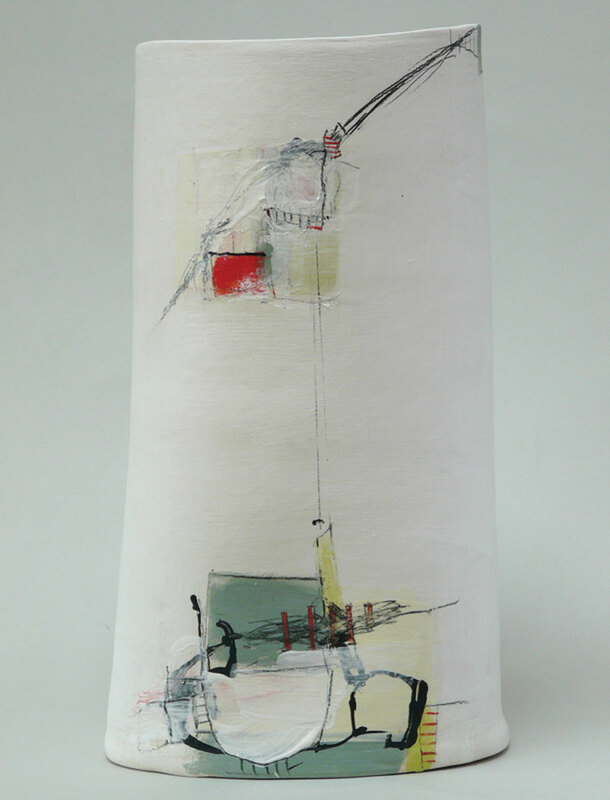 folio (222 x 330mm.) The document addressed to ‘Captn. Cyprian Southack’ appointing him in command of the ‘Turky Friggott’ [probably the Turkey Frigate], with remnant of seal. Presale estimate £2500-3500. To view the lot click here. The timing of the document suggests that Southack may have been commissioned as part of a larger force being assembled to deal with possible problems with the French in the West Indies, although this is supposition as no mention of a mission is contained within the document. Captain Southack was the father of Captain Cyprian Southack (1662-1745) who gained well-deserved fame for his cartographical work, and for the various maritime engagements which he took part in, or led, whilst employed in the colony of Massachusetts. 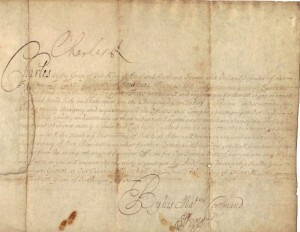 Toovey’s sold a similar document in a specialist auction at their salerooms on 17th May 2011, for £5300, which can be seen by clicking here. 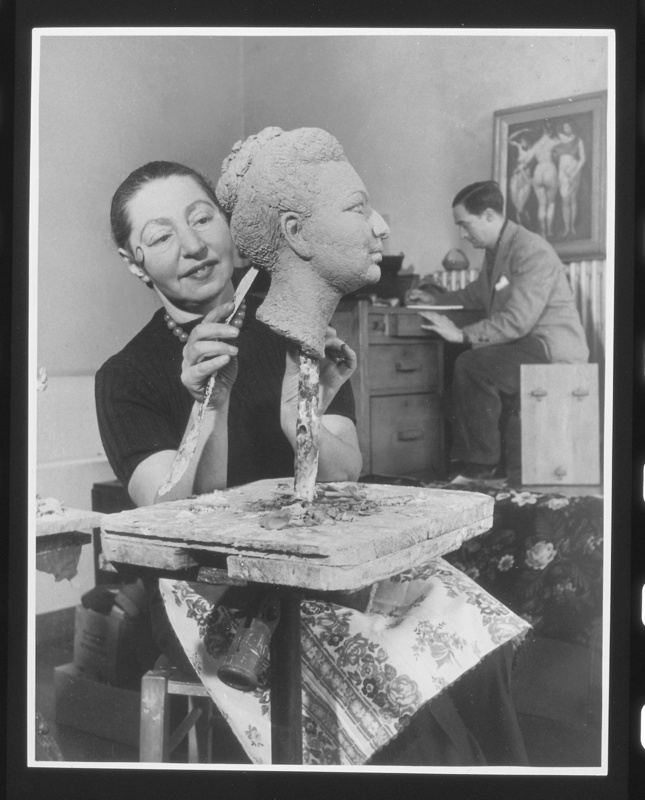 Fearless and feisty Dora Gordine stormed the art world of Europe from the 1920s to the 1950s, producing sculptures of nudes, portraits and public commissions. She also became involved in the early use of mass media advertising for the cosmetics industry. This is a rare opportunity to see this unique loan of over 25 sculptures, drawings, photographs, letters and magazines from Dorich House Museum and private lenders. The exhibition tours to Estonia in 2012 and Singapore in 2013. Guest Curator Brenda Martin from Dorich House Museum said: The social history of the 20th century is told through Gordine’s extraordinary life as an artist – wild Paris of the 1920s, exotic Singapore in the 1930s, war torn London of the 1940s and flamboyant America in the 1950s. The exhibition is accompanied by a series of talks and workshops for adults and family groups sponsored by Toovey’s Fine Art Auctioneers and Thomas Eggar LLP, a leading law firm in the south. John Bunker, Thomas Eggar LLP partner said: Thomas Eggar LLP Worthing is pleased to support the Dora Gordine exhibition at the Worthing Museum and Art Gallery. It’s part of our contribution to the vibrant life of the town. At the same time we are delighted to be a joint sponsor with Toovey’s. The collection brings something a bit different, some new cultural life to the town and with Worthing Museum being in a great central position it is one of those features of our community which is easy to take for granted. We’d wish to encourage the use of this valuable resource for Worthing, starting with this exhibition. Discover more about Gordine and her link to Worthing Museum by visiting the Museum’s website.